The Senate recently approved legislation I strongly supported to reduce the size of the Legislature. House Bill 153 would reduce the number of seats in the House of Representatives from 203 to 151, with each district representing approximately 84,500 constituents. Currently, each representative is responsible for serving approximately 62,000 residents. The proposed change requires an amendment to the state Constitution, which means the same bill must be debated and passed by both the House and Senate in two consecutive sessions, and subsequently approved by referendum vote of the people of Pennsylvania. This means it will have to pass both the House and Senate one more time before being placed on the ballot. I have also voted for legislation to reduce the size of the Senate from 50 to 45 seats – a move that will cut the cost of government for state taxpayers. We currently have the largest full-time legislature in our nation. I believe state residents should be the ones who decide if the size of our legislature stays the same, or if we downsize. By downsizing and streamlining several common processes within the legislature, I believe state government could run more efficiently and effectively. Not to mention, we could save millions in taxpayer dollars. The Penn State IFC/Panhellenic Dance Marathon, known by most as THON, is a yearlong effort to raise funds and awareness for the fight against pediatric cancer. Since 1977, THON has raised more than $127 million for Four Diamonds at Penn State Hershey Children's Hospital. THON 2016 will take place February 19 to 21, 2016. The key to THON is – For the Kids. Every year, the floor of the Bryce Jordan Center is electric as Penn State students dance, sing and shake their way to millions of dollars to fight pediatric cancer. They are cheered on by kids who have beat cancer and kids who are still fighting this horrible disease. It’s a feeling that bleeds into our community and is the personification of what it means to give back. I urge area residents to support this wonderful charity which has done so much to help children with cancer. For more information click here. 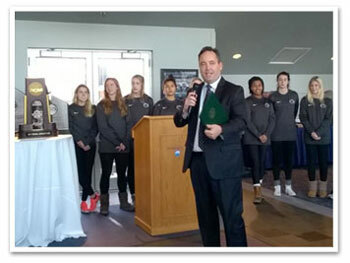 On January 21, Senator Corman attended the celebration for the Penn State Women’s Soccer program upon their National Title win in December of 2015. Coach Erica Walsh was named coach of the year and the team took home both the Big-Ten Championship and the Big-Ten tournament championship. The Pennsylvania Fish and Boat Commission recently released its 2016 trout stocking schedule. The Fish and Boat Commission plans to stock more than 3.2 million trout in at least 820 Pennsylvania lakes and streams this year. 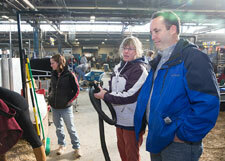 The stocking includes approximately 2.01 million rainbow trout, 641,000 brown trout and 525,000 brook trout. 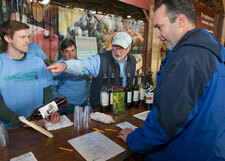 The stocking schedule is available online at www.fish.state.pa.us and on my website. With tax season now underway, the Pennsylvania Department of Revenue is providing area residents with assistance in filing personal income tax returns for tax year 2015. All taxpayers who received more than $33 in total gross taxable income in calendar year 2015 must file Pennsylvania personal income tax returns by midnight, Monday, April 18. Personal income tax assistance is available through the department’s Online Customer Service Center or by calling (717) 787-8201 between 7:30 a.m. and 5 p.m., Monday through Friday. State tax forms and instructions are currently available at www.revenue.pa.gov. Taxpayers may also visit a Revenue district office, listed in the government pages of local phone directories, for basic state personal income tax filing assistance. Applications are now available for the Property Tax and Rent Rebate Program and qualified individuals should file as soon as possible. The program, which provides rebates of rent and property taxes paid in 2015, is open to state residents age 65 or older; widows and widowers age 50 or older; and, 100 percent disabled people 18 or older. The income limit is $35,000 a year for homeowners and $15,000 annually for renters, with half of Social Security income excluded. The maximum standard rebate is $650, but supplemental rebates for certain qualifying homeowners can boost rebates to $975. The deadline for filing an application is July 1 and applications are processed on a first-come, first-served basis after that date. Application forms and assistance are available at no cost from Department of Revenue district offices, local Area Agencies on Aging, senior centers and my district offices. Applications are also available online or by calling toll-free (888) 222-9190. Local residents should be aware that there is no charge to file a state Property Tax/Rent Rebate form and they shouldn’t fall prey to companies offering to submit the forms for a fee. Since the Property Tax/Rent Rebate Program’s 1971 inception, older and disabled adults have received more than $5.9 billion in property tax and rent relief. The program is funded by the Pennsylvania Lottery and revenue from slots gaming. 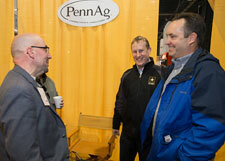 Senator Corman visits constituents at the 2016 PA Farm Show.